The MORryde SRE2-733X SRE 4000 Suspension System for 33" tandem axle wheelbase is a bolt-on upgrade that replaces the original stock equalizer with a rubber equalizer that gives your fifth wheel a smoother ride by providing 4 inches of suspension travel. Both the Equalizer and x-factor cross-member, bolt into your 5th wheel's existing frame, giving you the smoothness you want with today's rough road conditions. The SRE also gives you added strength with an adjustable x factor cross-member that provides lateral support resulting in reduced stress on the frame as well as protecting your trailer from road shock that can cause damage to your suspension. MORryde has designed the SRE 4000 system to be easily bolted onto your tandem axle 5th wheel & travel trailer with 33" wheelbase. The SRE4000 system can be used with trailers with GAWRs of 5200 – 7000 lbs. Kit includes (2) SRE/4000 Equalizers, (1) X factor cross-member, installation instructions, and all mounting hardware. SEE QUALIFICATIONS SHEET is instructions tab to ensure proper fit. Backed by a manufacturers 3 year warranty. 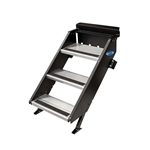 MORryde UO21-003 X Factor Performance Cross Member - (SRE, CRE And Other Equalizers) MORryde CTG60-3990W Sliding Cargo Tray - 39" x 90" MORryde CTG60-2090W Sliding Cargo Tray - 20" x 90" MORryde CTG60-2048W Sliding Cargo Tray - 20" x 48"
MORryde STP-4-27-05H StepAbove 4-Step RV Entry Step - 26" to 28" Door Width MORryde CTG60-2960W Sliding Cargo Tray - 29" x 60"